How To Save Money On Auto Body Repair. ​Our state-of-the-art auto body repair process is better, faster and more cost effective that the repair process at other auto body shops. At Columbia Dent Center we specialize in minor auto body repair. Our repair process is best suited for damage similar to the picture above and other pictures on our website. If you have auto body damage that has not severely damaged the vehicle's paint, then your vehicle may be a perfect candidate for our repair process. Our repair process involves removing the dent from the vehicle without repainting. 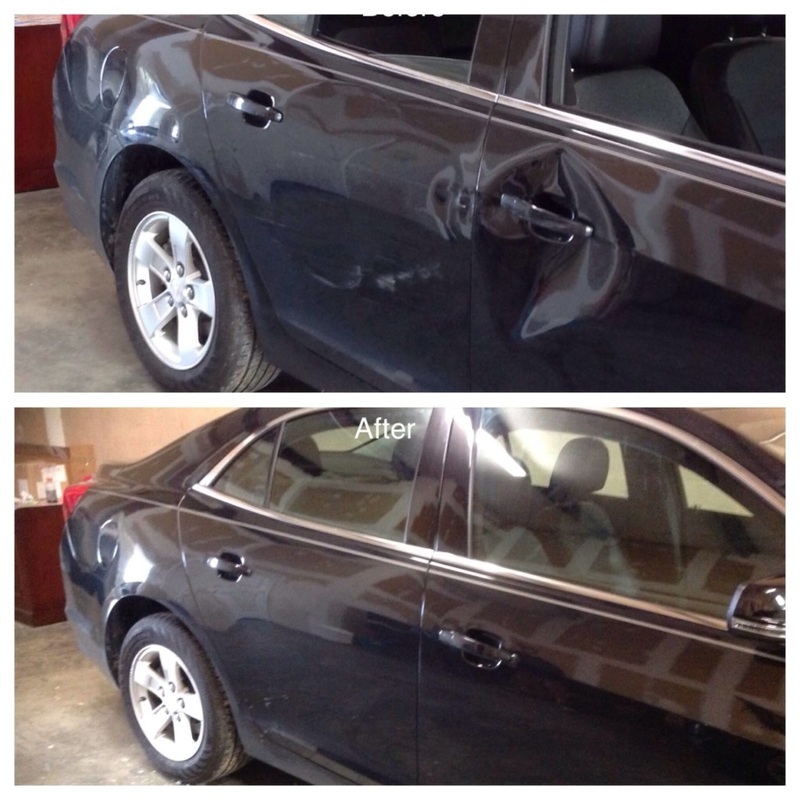 This website shows many pictures of before and after pictures auto body repair. The auto damage in those pictures is the type of damage best suited for our repair process. Since we don't paint your vehicle, you save a lot of money on your auto body repair. You also get your vehicle back much quicker. Sometimes, the same day you drop it off. If your car has been damaged by a mailbox, a deer or someone walking on top of it, then it's probably a perfect candidate for our repair process. A traditional auto body shop would have replaced the door panel on the vehicle pictured above. Once the door had been replaced, they would have painted both doors and blended the paint into the fender and rear panel. They have to paint all those panels in order to give the appearance of a good paint match. A new paint job may sound great to some, but the cost of auto paint is very excessive. Painting alone for the car above would have exceeded $1500. Add in the cost of the new door panel and the cost of this repair would be above $2000. Of course, you would also be responsible for paying your insurance deductible, so even if you filed an insurance claim, your out of pocket expense would be at least $500. At Columbia Dent Center, we pay your insurance deductible up to $500. In many cases, we can even give you money back.